Four days of season-ending cross-country ski racing at Anchorage, Alaska wrapped up with Friday’s Conoco Phillips U.S. National Championship men’s 50-kilometer and women’s 30k classic mass start races for 83 top Nordic racers. The men’s race offered a surprise finish with the win of little-known Aku Nikander, 23, a Finnish student in his first year at the University of New Mexico. Nikander (2.23:08) out-poled U.S. Ski Team’s Noah Hoffman, 25, timed in 2:23.17. Nikander and Hoffman entered the Hillside trails home stretch separated by only a few meters. Casting himself as a stronger sprinter, Nikander pulled ahead of Hoffman in the last 200 meters to win the five-lap clash by nine seconds. As the first U.S. skier across the line after 51.5k of racing, Aspen, Co. native Hoffman out of the Ski and Snowboard Club Vail secured another national title, his second to go with his 30k classic title at Black Mountain in Maine in 2012. Hoffman said afterward, “I didn’t really know anything about Aku, I didn’t even know his name. He’s a good skier. Former Sun Valley Ski Education Foundation racer Simi Hamilton, 26, of Aspen and Stratton Mountain (Vt.) School placed seventh of 50 starters in 2.28:12, 5:04 back. SVSEF Gold Teamer Matt Gelso was 24th in 2.38:00 on the five-lap course, Miles Havlick 34th in 2.43:58 and Mike Sinnott 41st in 2.48:51. Friday’s women’s 30k classic title went to USST “B” team racer Sadie Bjornsen, 24, of Alaska Pacific University. Her time was 1.35:58, 29 seconds ahead of Liz Stephen (1.36:27) leading a field of 32 finishers on the three-lap, 31.5k course. Bjornsen, from Winthrop, Wash. teamed up with Stephen, 27, of East Montpelier, Vt. to lead the women’s 30k ahead of Kikkan Randall, 31, of Anchorage (1.38:06) and Jessie Diggins, 22, of Afton, Minn. (1.38:14). It was the third career national title for Bjornsen, who led throughout out the downhill and flat sections while Stephen set the pace on the tough uphill sections. Bjornsen also won the skate sprint and 20k classic at Soldier Hollow in Midway, Utah back in 2013. Sophie Caldwell, 24, of Peru, Vt. finished sixth in 1.39:55 to cap an incredible first season with the U.S. Ski Team. Community School graduate Annie Pokorny of Stratton Mountain School placed eighth, 4:22 back, and Sun Valley Ski Education Foundation Gold Teamer Chelsea Holmes finished 22nd in 1.46:57, 10:59 behind. The Anchorage race week included three U.S. Ski and Snowboard Association (USSA) Super Tour events that ended a circuit season that included races at West Yellowstone and Bozeman, Mt., in Vermont, Minnesota and Wisconsin. Super Tour races were the men’s 15k and women’s 10k freestyle interval start events Saturday, March 22, the classic sprints on Sunday, March 23 and the new 4x5k mixed gender relay national championship Tuesday, March 25. The SuperTour prize money for the March 22-23 races started at $750 for first place and $500 for second in each gender. Emerging as the 2013-14 SuperTour overall winners after the Anchorage finale were Reese Hanneman, 24, of Anchorage and Alaska Pacific University and 33-year-old Caitlin Gregg, a Minneapolis native from Hayward, Wisc. 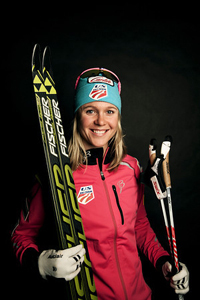 Gregg, a 2010 Olympian, became the first woman to win three American Birkebeiners when she won her second straight 50k Birkie freestyle race and $10,000 in prizes at Hayward in February. Hoffman captured the men’s 15k skate race March 22 at Anchorage with a time of 37:23, 11 seconds ahead of Scott Patterson from the University of Vermont. Gelso (38:53) placed seventh of 68 racers, Sinnott 13th (39:33) and Hamilton 27th (41:03). Kikkan Randall (27:27) was two seconds ahead of Liz Stephen for the women’s 10k skate triumph last Saturday in a field of 44 racers. SVSEF racers Holmes (28:22) and Mary Rose (29:56) finished sixth and 18th respectively. Reese Hanneman and Kikkan Randall earned the 1.4k classic sprint victories at Kincaid Park March 23, Sinnott making the men’s semi-finals. Randall, the top sprinter on the World Cup and famous in her native Anchorage, raced in her hometown for the first time since before the 2010 Winter Olympics. She recently won her third straight World Cup sprint championship. Winning the first-ever national mixed relay title March 25 were APU Nordic Center racers Reese Hanneman, Sadie Bjornsen, Erik Bjornsen and Kikkan Randall in 55:51, 46 seconds ahead of Hamilton’s Stratton Mountain School foursome in a field of 21 teams and 84 racers. The SVSEF foursome of Sinnott, Rose, Gelso and Holmes placed sixth in 58:16, 2:25 back. Havlick raced on the 10th-place SVSEF team with Anna Svendsen of the University of Utah, Noe Bellet of France and Jessica Yeaton of Montana State. The first two racers did two classic laps or 6.6k, while the third and fourth racers on each team completed two freestyle laps or 5.2k.